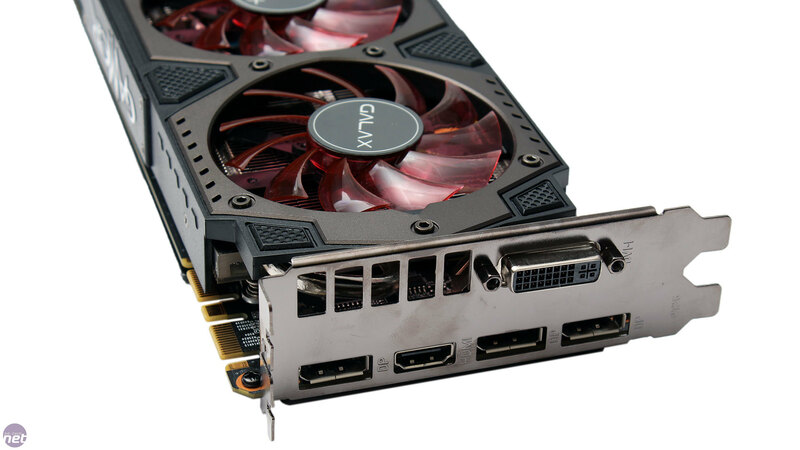 Galax is a new brand in the world of graphics card manufacturers, but it's by no means a new company. It is essentially a new global brand that incorporates both Galaxy and KFA2. The latter brand was originally introduced by Galaxy around five years ago for the EU market, where Galaxy Technology was already a registered name. Galaxy was one of the original OEMs for graphics card manufacturing having started around 20 years ago. As such, mass production is not an issue for Galax, which is able to hit the ground running; it is the number one manufacturer of Nvidia board partner cards in the APAC regions with an overall RMA rate that's less than 3 percent. 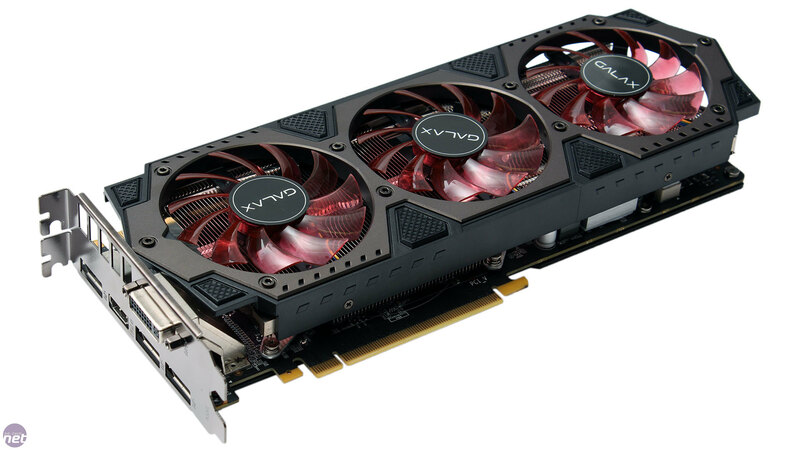 The new brand Galax is kicking off with SKUs of the Nvidia Maxwell-based GTX 900 series, with a selection of GTX 980 and GTX 970 cards both available. 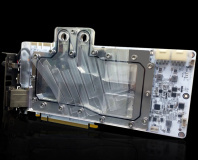 Today, we'll be looking at the GTX 980 SOC, which utilises a custom cooler and ships with a factory overclock. Sadly, this overclock applies only to the core and not the memory, though this is the case with the majority of GTX 980 cards we've seen available. 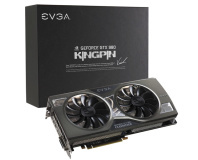 The overclock is also the exact same as that of the Gigabyte GTX 980 G1 Gaming which we saw earlier this month, with the core running at a base clock of 1,228MHz (boost 1,329MHz); a 9 percent increase over stock. Supplied in the box is a pair of dual Molex to 8-pin PCI-E power adaptor cables, the reason being that the card has upgraded both top-mounted 6-pin PCI-E plugs from the reference model to 8-pin ones and this is again the same as we saw with the Gigabyte card. Power draw is thus likely to be higher, so hopefully there's a return in the form of higher overclocking potential. 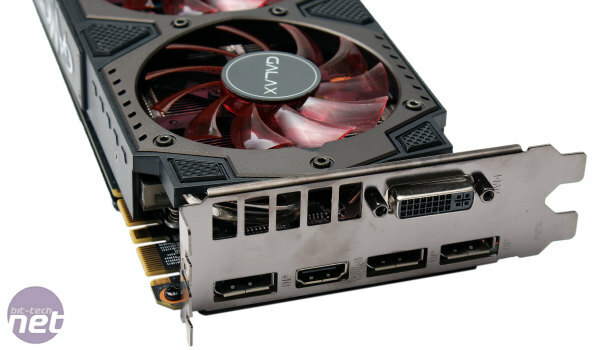 Galax sticks to the reference set of display outputs: three DisplayPort 1.2 connections, a HDMI 2.0 one and a DVI-I one. This is a healthy selection of connectors that's suitable for the high-end graphics market, so no complaints here. That said, a DVI to VGA adaptor is supplied just in case you haven't upgraded your monitor in a very long time. Build quality is very good. The cooler shroud is made mostly from plastic, but it's thick and solid and has a metal top cover as well. The rear of the PCB plays host to a thick metal backplate, which helps to brace the card against its own weight and makes it reassuringly rigid overall. It also has aesthetics benefits and will dissipate heat from the PCB too. The PCB is 267mm long, the same as the reference one, but the cooler shroud extends the GTX 980 SOC's length to just under 300mm. 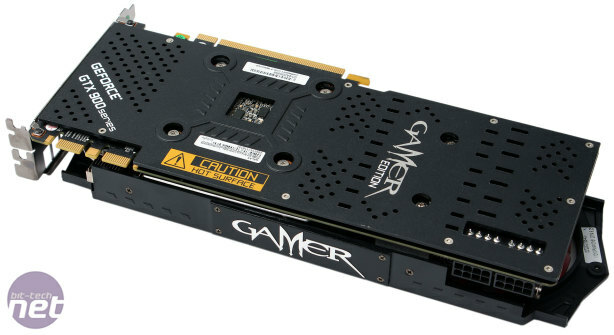 It's a dual-slot model, so if you really wanted you could utilise the two SLI connectors to build a 4-way SLI set-up, as the GTX 980 is one of the few cards to support this. The backplate does have a series of holes punched through it, which should help airflow circulate over the back of the PCB, but even so cramming that many air cooled cards so close together is not recommended; water-cooling is a far better option. 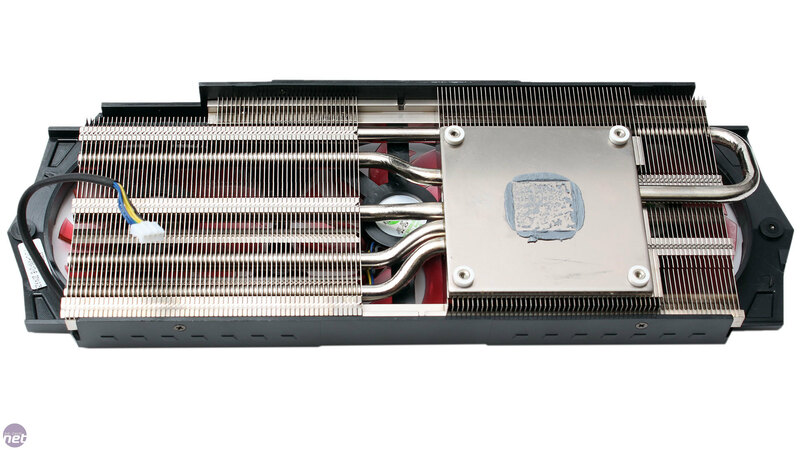 The main heatsink is used to cool the GPU only. It uses two aluminium fin stacks paired with nickel-plated copper for the large flat baseplate and five heat pipes. While a fair amount of thermal paste has been used, the amount between the GPU and heatsink is a little thinner than we're used to seeing, but it should still be adequate. Thankfully, the memory chips and power circuitry haven't been forgotten about either, as both have their own dedicated heatspreaders, with contact made via thermal pads. Considering there's a backplate as well, heat dissipation should be very thorough, with all the key components well looked after. Cooling it all down is a trio of 80mm downdraft fans, which, thanks to the open cooler shroud, will dump the majority of hot air back into your chassis. The PCB is a fairly standard GTX 980 affair, with the usual 6+2 power phase configuration. A single 4-pin fan header is used to control the speed of all three fans together, so there's no individual fan control, though this isn't a feature many will miss. There are also two unused headers near the dual 8-pin PCI-E power plugs; the 2-pin is an optional power header for LEDs while the 4-pin one is the IR PWM controller debug port. PNY's fastest GTX 980 features overclocks to both the core and memory, but just how quick is it?